I have noticed another minor visual bug, this time with Single Choice Set. I am using Wordpress platform and H5P website to create content. Latest plugin and content type version. When you set several questions in Signle Choice Set, every next question after the first one has answer automatically highlighted. Doensn't matter if the asnwer is wrong or right it always highlights the first option. I test this only within Interactive Course module. I think your finding may be related to an issue on github. Thanks Tomaj, I understand this is a keyboard focus, that is why the first option is highlighted. This also occurs for Multiple Choice question types. 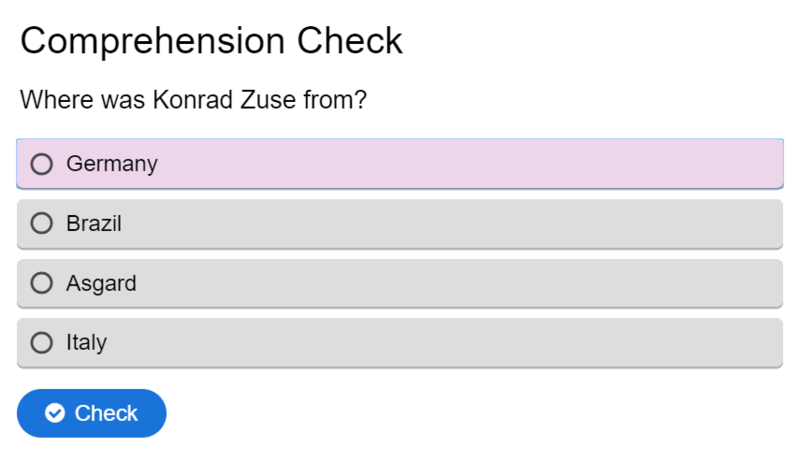 I also noticed that even when set to randomize answers, the first option is frequently the correct one and having it highlighted could be seen as a hint to the answer before students even read all the other options. This is not good. Well, I think the best thing to do here is to remove that focus? Or make it invisible, since i think 80-90% of people either click or tap on answers. I don't remember seeing a setting for this. Is this something anyone can do or an update that would need to happen? I am sure someone of the developers will fix it eventualy. Instead of changing the highlighting maybe we could look into the randomization functionality and see if it is actually random. Viewers of content I've created with H5P using this new update have all stated that they assumed the new keyboard-highlight was a hint for, or accidental signposting of, the correct answer. It has created a lot of confusion. Also, if the single-choice option is used, subsequent questions after the first, where they used to run in succession, no longer load, and the system freezes after the first question has been answered. This is a really annoying update - do we know if there is anything I can do to revert my H5P interface back to how it was before? I'm using a drupal platform on a windows 10 laptop. The keyboard-highlighting was added as a feature for keyboard users, so they will know their context. You're right that it might be a bit confusing, but removing it outright will degrade accessibility and usability for keyboard users, there may be room for a compromise here. I've tried to reproduce the single choice set issue you're observing without much luck. Make sure you have the latest version of Single Choice Set. Do you have a link where we can see the issue in qestion or can you provide some screenshots and any info that may be displayed in your browser console ? The update is a really important part of the H5P vision of making web content available for everyone, so we're very sorry that this has degraded your experience of H5P. We'll definitely have to look closer at how we can make sure that necessary elements like focus for keyboard users does not feel distractive either through looking at improving the design or only displaying them when we're positive that the user is using keyboard or assistive technologies. If I may add that I have also experienced that in single choice set questions stop loading, you need to go to next slide and than back to previous slide and the next question will appear. However this happend only few times for me. If I catch the bug again I will post a video. Can you make keyboard focus invisible? Or only active if you click on keyboard arrows? Provide off/on option for "Indicate Keyboard Select at start"
When you say you're not able to reproduce this problem, what is it that you aren't able to reproduce? Highlighting an answer before the user can even read the other options doesn't make sense. The problem is that when a question appears with one of the possible answers shown in a different colour, the natural assumption for most people is going to be that this is a hint at the correct answer. I'll attach a screenshot to demonstrate the problem. I think the logical compromise here is to just provide an option to turn "keyboard highlighting" off or on in the settings, just like the option to not allow skipping through the video, the sooner the better. This is what I'm not able to reproduce, the system freezing when using Single Choice Set. Highlighting an option does make sense for keyboard users as it is the next actionable element in their workflow so it makes sense to move the focus there, however I understand what you mean. I think we'll move focus to the question text instead and remove the outline, as icc has suggested, this should solve the problem with showing the outline, and will keep the content accessible by preserving the tabindex order, they would be able to tab to get into the alternatives from there. I suggest we remove all these new focus effects instead and only show them for keyboard users. For a keyboard user, it will be a step back if we put the focus on the question text instead of an alternative. For a mouse user, the focus effects might be perceived as ugly and confusing. First of all thank you for your effort and great latest improvements on h5p. We would like to report that we have received a technical issue from one of our clients related with this problem. It is very confusing for the user to visualize the keyboard focus. (example attached). We have found an issue related: https://h5ptechnology.atlassian.net/browse/HFP-1763. Do you plan to face it soon? Could you elaborate on this ? Why is it hard for the user to see the keyboard focus ? From the attached image it seems like it is quite easy to see that the keyboard focus is on the first element of the "Summary" content. Yes, sure. The thing is that the user doesn't understand why there's one option selected. 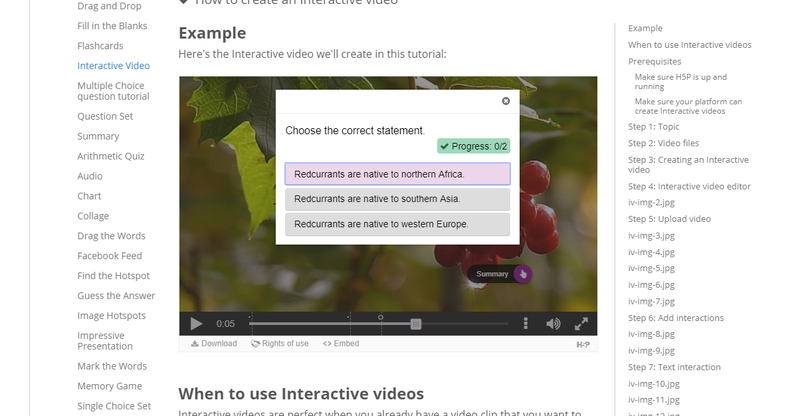 The user said: "...when using interactive video quizzes, I'm getting answers that are already highlighted before I select or hover over them for some reason..."
It seems quite confusing to open a quiz and have one option selected with a blue border and a red background. It seems that the system is showing the wrong answer as selected (because it's a red colour), or any other strange error. The users are more used to show the keyboard focus only with the blue border. I think that removing the red background would improve the comprehension without loosing functionality. Thanks for explaining, that is indeed a good point. I can't give you an e.t.a. for when the issue will be prioritized by the H5P Core Team, but improving the user experience of content types is definitely always something that is important. We're always happy to receive pull requests for these types of things if you have any developer resources. Thanks again for the feedback. This will be an important solution to avoid answers being pre-selected and perhaps nice to have as an option to enable (most people use a mouse or finger anyway :D ).